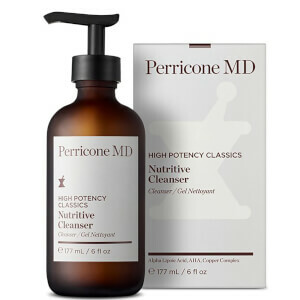 Refresh and revitalize skin with the Perricone MD High Potency Classics: Nutritive Cleanser; a scientifically formulated daily cleanser ideal for normal and dry skin. Fortified with Dr. Perricone’s exclusive Alpha Lipoic Acid complex, the soothing gel cleanser sweeps away dirt, makeup and impurities from the surface layer without drying out skin or stripping away natural oils. The addition of anti-ageing DMAE helps replenish elasticity levels and support facial contours for a visible lifting effect, minimizing the look of fine lines and wrinkles. Ideal for daily use, skin feels softened, hydrated and perfectly prepared for further treatments. Dispense 1 to 2 pumps into palm of hands. Gently massage and lather onto damp skin. Rinse with warm water. Follow with a Perricone MD treatment and moisturizer.